Norway: JOWST wins Melodi Grand Prix 2017 with "Grab the Moment"
Whether it was a so-called “wrecking crew”, Sami joiking or country and western you wanted, tonight’s Melodi Grand Prix had it all. But the important thing was for Norway to select its act for Eurovision 2017. After two rounds of voting, Norway will be represented in Kyiv by JOWST with “Grab the Moment”! JOWST made it through to the Super Final, where they were victorious over three other songs. The other super-finalists were (in finishing order): Ammunition, Elin & The Woods and Ulrikke. Tonight’s result was decided in two ways. All ten acts performed first, with the four superfinalists decided by a combined jury and televote. Our own William read out the points for the UK jury! Those four acts then all performed again, with the public having the final say on the results. What do you think of Norway’s decision? Do you think they’re heading back to the final after their year out? Shout out your thoughts on the wiwibloggs app or in our comments section! Ella amazed me last night. She killed it on the stage. Still not in top 4? HOW CAN IT BE POSSIBLE? @Nickc – I agree. There’s only three or four songs I actively dislike, and I’ve rated them accordingly. The rest I’m okay with, like, really like or love. Some of them give me more life than others. I really do not understand the negativity. You guys complain about everything. And I strongly disagree that it is a weak year. For me, there are at least 15 songs that could win with right staging and live performance, including but not limited to, Italy, Belgium, France, Portugal, Sweden, Macedonia, Romania, Albania, Hungary, Belarus, Norway and Azerbaijan. The only songs I dislike are Croatia, Malta, Netherlands and Denmark. But I think overall it is an awesome year! It’s nowhere near as much fun as Elin and the Woods, but it’s OK. I can see this being borderline, but ONLY tenth place, not higher. “If Love Was a Crime” had sampled high-pitch vocals in the introduction. When it was performed live, they swapped it for a flute line with the same melody. The rules are very clear about all vocals being live, so Spain and Norway will have to figure out a solution. It’s an ok song with nothing much happening on the stage. I don’t know how they can stage it better in Kyiv though. At least this actually represents the (tropical) house EDM-pop sound that Norway is known for. There were only two decent songs out of the bunch, from Ammunition and JOWST. Well, it was a decent choice. Until now, I am trying to comprehend the hyp on Ella’s song. I think it was the best possible outcome from the train wreck called Melodi Grand Prix 2017. Now they have a chance to qualify, even top 10.
i’m upset ellla won’t represent norway but this isn’t too bad i guess. I like it. Catchy. Memorable. Good luck to Norway. They were wronged last year with Icebreaker. That was (and still is) an awesome song. Will it qualify for the grand final? My instinct says “no” at the moment (sorry). I don’ know why people got a problem with it. I like it, I think it’s really good even! Really impressed by the live performance.. when I listened to all the studio versions I didnt even notice this but wow.. Norway probably had one of the worst national selections but still managed to make the perfect choice.. good job! Wish Sweden could be represented by something as good as this! How are they going to do those special effects vocals live on stage? Same for Spain’s chorus (since it was pre-recorded background bits). Something about enhancing one’s voice even live on stage seems unfair. Am I the only one who LOVES this song? Don’t understand the negativity. This song is current, very well staged, very well sung and the best and only choice for Norway. Borderline qualifier at best, but I think it will/should stay in the semi. Yas! The only decent song. Stunning production. It sounds 2017. Amazing verses. Norwegians know they made a huge mistake sending Agnete instead of Freddy Kalas. Oh dear. This won the televote over Ammunition? I’d like to see the detailled results and then be done with Norway this year. Wrecking Crew stays on my iPod. Norway probably in their semi final. I’m so glad I stopped caring about the results long ago and became merely a curious follower. Otherwise, I’d be nothing but annoyed. And isn’t Eurovision supposed to be, I don’t know, fun? That made the 2nd Semi Final much much easier to deal with. Not every song has to be good! Norway proved this! Phew!! At least Iceland chose wisely. Both the songs in the icelandic super final were better than all the other three NF winners. Seems like I’m the only one who LOVES it! My 3rd. I hope it can do a Common Linnets <3! It’s bland and instantly “I’ll check my Facebook/Twitter/Instagram while this goes on my TV” kinda of thing. Norway, better luck in 2018. I predict TOP 2 in MGP and Jows was my second favorite , Ella was first , but she ruin her chance with stage performance, they try to copy some from Andorra at Eurovision 2006 . Good and unusual song for Eurovision. Very good chance for final, in final from 12 to 18 place. Ella SLAYED her stage performance. So proud of you guys for giving her the top points. But I’m glad Norway went with Jowst. It will stand out from the sea of ballads this year along with Denmark and Sweden’s songs. I agree with the UK judges, Ella was far the best. Not that there was a great selection anyway. Oh Well good luck on the night Norway. NRK unfortunately didn’t let us watch the NF (at least out of Norway). Thankfully, I found the performances on NRK’s youtube channel! So I was able to watch them. Ammunition just brought the house down!!! They were amazing! Full of energy! Elin & The Woods was also a great performance! I didn’t quite like the song at first, but when I saw the live performance, I enjoyed it! Really beautiful! About the winning song, it’s a good song and I liked the studio version. However, live it’is lacking sth. Not sure it’ll qualify! A mess and a half, but I’m saving my meltdown for the Lithuanian article. For those complaining about geo-blocking, if you had used the link provided by the Eurovision.tv website you would have been able to watch it with no problem, like I did. NOOOOOOOOOOOOO!!! What have done? You fools. 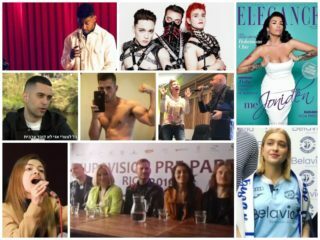 Eurovision 2017 is becoming one of the worst of this century! Three not great songs have already been chosen…..atleast Robin has a good performance though……..only Iceland can save the day now!! If there’s one lesson I’ve learned this season, that would be to never get my hopes up because the best song will practically never win the selection. Terrible choice. Not nearly as bad as Lithuania, but it’s still really bad. Well hey, at least one thing is for certain: we aren’t headed north for next year. So to be fair the song itself is decent. But it is a song with a niche audience and it is probably not going to do well in Kiev. He has a similar style to Lucas Nord. I like it.